The next two pages of the Freedom propaganda mag, following yesterday’s post. The fact is that scientology has official CHURCHES OF SCIENTOLOGY (except in countries where they are forbidden to claim they area church) in a grand total of 30 countries around the world. This is the same 30 countries that they have had official churches in for the last 20 or so years, with the additions of Ireland and Taiwan. They try to fudge it by adding on some entities that cannot even be found on scientology.org. 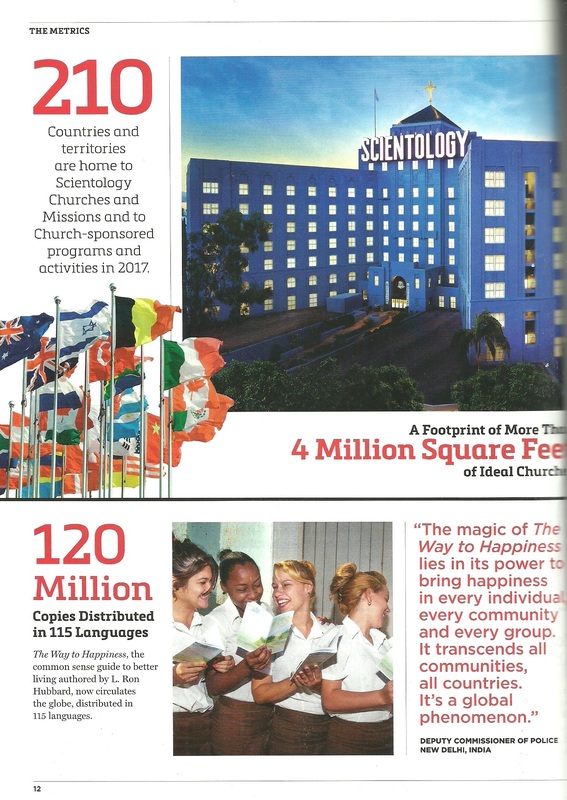 There are scientology missions in approximately 30 other countries. Beyond that, this is a complete joke. They might have printed 120 million copies of the WTH. They are constantly haranguing scientologists to give money to print these at exorbitant prices. Many of them get dumped on the street or are left sitting in basements and garages until they are eventually thrown away. The 4 million square feet is likely the only number that is true. They hope the world believes this is proof of their massive international expansion (“see, ot everyone thinks we are an abusive cult, we are growing in other parts of the world”). Of course they don’t ever explain they have 4 million square feet of empty buildings. So does Kmart. Buildings alone do not a successful organization make. And there is nothing inherently wrong with the Way To Happiness. What IS wrong is when scientology tries to claim that this booklet has reduced the crime rate by 50% in Colombia or virtually eradicated gang violence in Los Angeles. These claims are made to keep the flow of funds coming. Well-intentioned people want to give money to a cause they believe helps others. The truth is their money goes primarily to PROFIT and ROYALTIES for L. Ron Hubbard (now channeled to the Church of Spiritual Technology). And that really says it all about scientology’s “humanitarian” initiatives. Each of them is designed and staged to garner propaganda and praise for scientology. 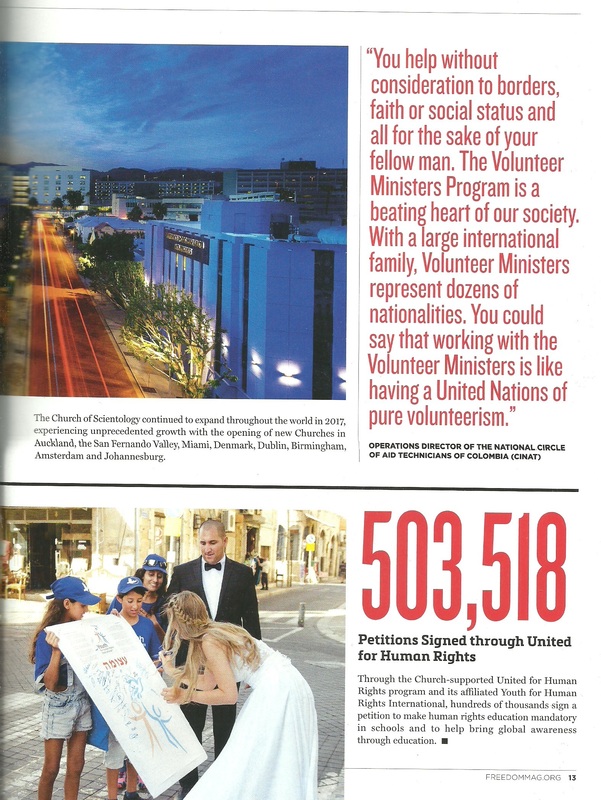 Nothing happens in scientology’s “humanitarian programs” unless they result in propaganda. This is why you see people in yellow T-shirts posing for staged shots as a priority over doing the work of helping people. Or why they have 4 foot high graphic cardboard “petitions” instead of the typical clipboard where you give your name and details. Scientology: The Greatest Show on Earth wannabees. Whistleblowing Scientology is easy. The general public already knows the truth about Scientology, and they are not curious. They know about Aftermath and the damage done to practically anyone who has been in Scientology for many years. Freedom magazine is only read by Scientologists, which is true for the vast majority of readers. Are any of these numbers fact checked? No. The statistics are vastly inflated to keep the average Scientologist in a false paradigm based on false data and false news. Here’s my perspective on what it means to whistleblow on Scientology. They will always claim discrimination and bigotry, and an attack on their first amendment right. No lawyer wants to touch a Scientology case, nor any politician or any career law enforcement officer. I could speculate and say this actually emboldens the executives and sea org to carry out activities that are borderline illegal, perhaps illegal, because they know they can get away with it. 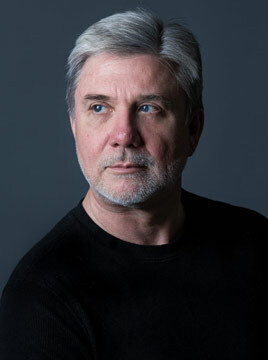 The answer is to categorize them with their brethren, the groups that lil’ dave has spent his career trying to distance from; their cousins in whacked-out ideology: the bigfoot hunters, ghost hunters, ufo chasers, and even new-agers. Marginalize by exposing what their ideology really teaches: the truth about Scientology. Mike, I like the distinction you made between the uses of Way To Happiness and the outrageous claims the cult makes concerning this little booklet! I agree; there’s nothing wrong with it, but to claim that it has the miraculous powers the cult says it has is at best laughable and at worst lunacy. Crime statistics are so easy to find – how could anyone with even one brain cell fall for this bologna!? It’s because they don’t want to know the truth. In South Africa, it was claimed a WTH campaign had reduced crime in one prominent city by “40%”. Crime is rampant in South Africa and a hot topic of conversation. If that were really true, everybody would be talking about it. Not even scientologists spoke about it much, so they clearly never believed the hype. Crime statistics are well reported here, and didn’t show any marked decrease. BoiledFrog’ology. If only the poor saps in the cauldron would wake up and simply hop out before it is too late. I prefer Frank Zappa’s term for them:Appliantology,founded by L.Ron Hoover. Now here is something you’ll really like. My paraphrasing of Rocky J. Squirrel or whatever his name was. 210 nations would be every nation on Earth, but maybe they mean nations on other planets. I can’t help but be reminded of the “Rocky & Bullwinkle” cartoon series way, way back. Rocky sighs, “you know that trick never works.” And indeed it doesn’t but Bullwinkle tries it every program. No offence to the great cartoonists who put that series together but Scientology & Scientologists keep expecting that rabbit to appear, and they pay extraordinary amounts of money in anticipation. Terrific analogy. One of my all time favorite cartoons. Rocky & Bullwinkle were the bomb when I was a kid. “Rockey and Bullwinkle”…. Such a seditious show. If we watched them now, we’d hear so many truths that went right over we wee kids’ heads then. I’m going to paraphrase, “Hey Rocky, watch me pull a rabbit out of my hat.” a bit. I was going to use “arse” but this time the US word worked quite nicely. It’s interesting to note Rocky was a flying squirrel. Rocket J. Squirrel was his full name. Love the Rocky and Bullwinkle analogy , I would watch it religiously as a kid ( was that the wrong thing to say ? ) . There is heaps to read on the internet about Scamology as to where they have been banned or not recognised as a religion , Wikipedia is one , another is worldlibary.org and whyweprotest.net . Thing is who do we tag in Scamology as Rocky and who as Bullwinkle ? . Unfortunately after some research I found that there is 1 office ( for want of a better word ) of Scamology here in my home state of Tasmania Australia , It’s in Launceston but as to date have not found any others . I will be keeping a close eye on this lot and if I see them in public trying to flog their BS , I will be publicly calling them out as the liars and a bare faced cult as we all know they are . PeaceMaker: this is a great comparison. North Korea: “The Happiest People on Earth.” When in reality the misery and suffering outweigh any happiness in North Korea. The CoS launches propaganda about happiness complete with epic lies. Meanwhile, underneath the epic lies is an organization creating pain and suffering. For Korea to “win” a war, they — or more correctly their dictator or his successor — needs merely to survive. If the country or peninsula winds up a radioactive wasteland, no matter. My thoughts exactly Interested2! Disgusting. That picture is worth 500,000 + words and none of them very nice. I have ~37 trillion cells in my body that know scamology is an evil cult. Hum, if we are talking about numbers I see there is a big out point – omitted data. 1,000s of Scientologists that have departed the cult since Miscavige took over. 100s, of families torn apart due to the covert, but always enforced disconnection policies. 1,000s of harassed individuals who had expressed their views on the abuses, even though Miscavige alleges (wrongly) that it is just counter intention. 1,000s of altered original materials due to the Golden Age of Tech. 1,000s of repeated courses for the 3rd or 4th time. Millions of dollars ripped off parishioners and other millions of tax evasion. And I could go on, but even Einstein would be baffled by the number of abuses Miscabage has perpetrated. In 1978 (40 years ago) the Advance Org of Los Angeles (AOLA) moved into its new building on L.Ron Hubbard Way. They totally filled the building, with no room to expand, when they moved in. California has the biggest concentration of Scientologists. Despite all of this, AOLA has never needed a bigger building. That’s all one needs to know to get a true picture of Scientology’s “expansion”. Scientology is a real estate scam dressed as a religion. I’ve heard that, Mat. I’ve heard from people that back in the good old LRH days (1960s-late 1970s), Scientology was actually a fun place to be and that course rooms were full. Story goes that all that changed when Senor Dwarf took control. Alcoboy, in the 60’s & 70’s the S.O. was a sadistic organization run by the sadist Hubtard. Degradation of members was routine. Dangerous physical punishments were meted out to children by Hubtard hisself. Don’t become an idiot by believing that garbage. I don’t think he means “auditors” and “auditing” as in CPA’S for example. Rather auditor and auditing in Scientology. Completely different things. That was a tongue in cheek Christine ….. because these days the goal of $cientology is straight donations (Idle mORGues and the IAS) rather that training and auditing. When are ya gonna get yer Briefing Coarse redone good buddy. Time to get some of those CPAs back in the chair. That would be in reference to Your ‘Counter-intentioned Piss Ants’ ……….. as ecclesiastically minded as You must be with Your Oh so heavy worklode and all. Scientology only gets “hot” in a new area when a couple of FSM’s figure out how to make money with it. This was the case in Miami in the 1970’s. I never would have made it to the Freewinds in 1988 without the push from the FSM’s. We had Friday night meetings in a beautiful suburban home away from the org with people who had some interest in the subject. This kept the staff at bay and allowed a more personal approach. All of the color printing in the world means nothing compared to personal contact. The underlying theme for these meetings was that Scientology could help with spiritual progress. I look back after almost thirty years to passed away FSM’s driven to despair and a hollow promise from Hubbard never realized. But there was a lot of money to be had by those who went with the movement. I do remember that when I returned to Miami after the famous OT VIII briefing in 1988 in which Hubbard claims that Jesus was “a lover of young boys and men” that one of my FSM’s broke down in front of me. He was terrified because Hubbard said that he could ignite into “spontaneous combustion”. He confided his fear in me. Well that was seventeen years down the drain for me and a ton of money burned and the passing of two wonderful people. You make a critical observation as to the difference in the church-that-once-was and what now asserts itself as the ‘ideal clusterf**k’. What i now see with the ‘ideal clusterf**k’ is WTH pamphlets handed out by robots, video presentations at an org instead of introduction lectures by a trained old timer, all live questions responded to with a book you need to buy, and look look look at all of the big hyuge building we have have have. Nothing spiritual about any of it. THEY ARE CONFRONTING NOW VIA MEST. Since they are confronting with MEST, all they want in return is your MEST (money). Confronting via mest. Wow, Jim, that’s exactly what they’re doing. Confronting with a via. They can’t directly to people anymore. And whoa! In Scientology, (as we former ins well know) ALL inabilities to confront can be sourced to overts and witholds! Wassup with all of yer Oh Dubble Yews………….good buddy! !